Dice the red apple, green apple, white nectarine, strawberries and grapes. Combine and set aside. Chop the mint leaves and add to the fruit. Add chocolate chips and serve immediately or refrigerate until you’re ready to serve. Serve with cinnamon pita bread or sweet cinnamon chips. If you can't find white nectarine, use white peach or banana. This way you'll still have the original colors of the salsa. For an even sweeter salsa, add 1-2 teaspoons honey and a few drops of lemon juice. We love summer because we can enjoy a variety of fruits. We love fruits prepared in a shape or form. At home, we usually eat fruits whole, apples, grapes and bananas, or in the case of watermelon and other types of melon, we cut them, but we never tend to combine different types of fruit. 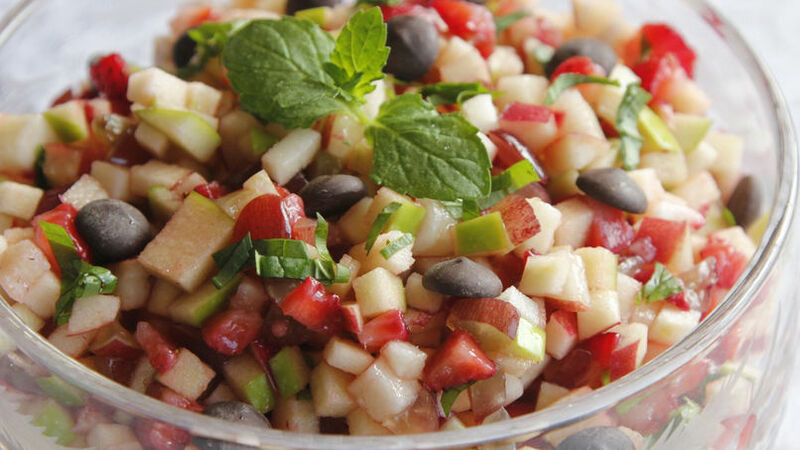 So I thought it would be fun to create a fruit salsa, kind of like a sweet pico de gallo. As you'll see, this salsa has white, red and green colored fruits with a special touch of chocolate to sweeten the palate. Serve it for dessert or as an afternoon snack. It's refreshing and delicious.